Charlotte Betts began her working life as a fashion designer in London. A career followed in interior design, property management and lettings. Always a bookworm, Charlotte discovered her passion for writing after her three children and two step-children had grown up. Take two pound of Flower, dry it and season it very fine, and searce it, mingle your Flour and Sugar very well, then take a pound and a half of sweet butter, and wash out the salt, and break it into bits with your flour and sugar, then take four new-laid Eggs, and four or five spoonfuls of Sack, and four spoonfuls of Cream; beat all these together, and put them into your Flour, and knead them into a paste, and make them into what fashion you please, and lay them upon paper or plates, and put them into the Oven, and be careful of them, for a very little thing bakes them. I decided to try the recipe but made only a quarter of the quantity. 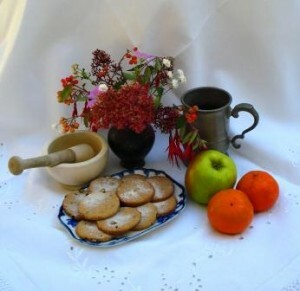 In the seventeenth century the newly milled flour would have to have been sieved and dried first, the preserving salt washed out of the butter, the spices ground in a pestle and mortar and the sugar cut from a block and ground and sieved. For authenticity I used half wholemeal flour and half white flour in an attempt to replicate the coarser flour available at the time. There was no unrefined sugar then so I used half white and half brown sugar for the same reason. The sack was replaced by sherry. As a variation, I added a handful of currants to half the mixture before rolling out the dough. Since Susannah’s mother worked in an apothecary shop she would have a ready availability of a variety of spices and so I used artistic license to add these to the modernised recipe below. Rub the butter into the flour and spices. Stir in the sugar. Mix in the beaten egg and sack. Roll out to 1/8” thick and cut into approximately 30 circles 2” in diameter. Prick all over. Cook on a greased baking tray for 15 minutes at 180°. Sprinkle with a mixture of ground cinnamon and sugar. This recipe is quick and easy and makes a sweet, pale brown biscuit. In my opinion the egg wasn’t necessary and without it the resulting biscuit would have had a crisper texture. Adding the cream would have made the mixture too wet. Nevertheless, it was an interesting experiment and friends and family polished off the lot almost before they were cool! Here are some other recipes in common use at the time. Take five quarts of new Milk from the Cow, and one quart of Water, and one spoonful of Runnet, and stirre it together, and let it stand till it doth come, then lay your Cheese cloth into the Vate, and let the Whey soak out of it self; when you have taken it all up, lay a cloth on the top of it, and one pound weight for one hour, then lay two pound for one hour more, then turn him when he hath stood two houres, lay three pound on him for an hour more, then take him out of the Vate, and let him lie two or three houres, and then salt him on both sides, when he is salt enough, take a clean cloth and wipe him dry, then let him lie on a day or a night, then put Nettles under and upon him, and change them once a day, if you find any Mouse turd wipe it off, the Cheese will come to his eating in eight or nine dayes. Take one pound and an half of fine flower, of sugar twelve ounces beaten very fine, mingle them well together, than take half a pound of almonds blanched and beaten with a little rose water; mingle all these with as much sack as will work it into a paste, and put in some spice, some yest and plumped currants, with a pound of butter; so make it into a cake and bake it. From Sir Kenelm Digby: The Closet of Sir Kenelm Digby Opened. 4 oz (125g) caster sugar sprigs of rosemary or the peeled zest of a lemonBeat the cream, wines and sugar together to form a thick froth, and spoon into large wine glasses. Insert the rosemary or lemon as desired, and allow to stand in a cool place for at least 12 hours before serving. Take Quinces and weigh them, core and pare them, then take for every pound of Quinces a pound of Sugar; then take Quinces and grate them and strain them; for every pound half a pint as the juyce of the Quinces, and half a pint of fair water; the water, and sugar, and syrrop must be first boyled and clean skimmed, then put in your Quinces and turn them still to keep the colour of them: then let them boyl so till the Quinces be tender, they must seethe very softly, for fear of breaking; and ever as the scumme ariseth, you must take it off with a feather. This page is still under construction but I intend to collect recipes and remedies from the seventeenth century. If you have an interesting recipe from this era please do send it to me. Charlotte Betts © Copyright 2019, All Rights Reserved.